Here we are again, knocking at the door of the beginning of a new Church season – Advent – which begins in less than a month on December 2! Every year, for the last 8 years, I have been building an Advent and Christmas Planner and sharing it. In truth, this planner has been in existence longer than 8 years, but in those early years it existed as a few lists and scraps of paper that I cobbled together here and there in order to set an atmosphere of quiet anticipation in our home. As children grew, and the internet made sharing so easy, I began to assemble my lists and resources into a document, that over the years, has grown into a book. Last year, my Advent & Christmas planner was 21 pages long and this year the book is 35 pages! What can you expect from this planner? 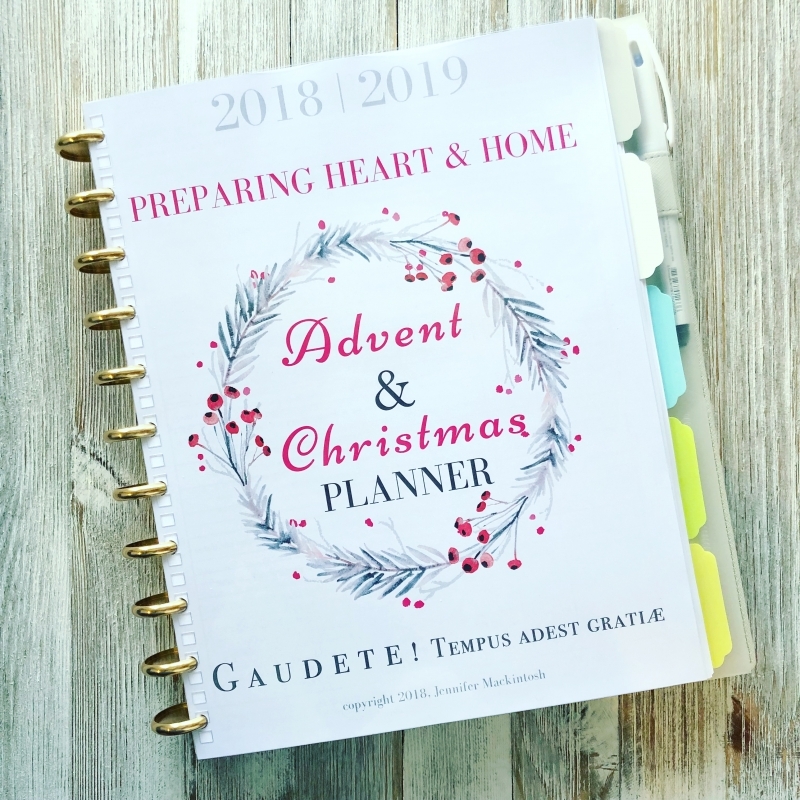 This planner is first and foremost the work of a simple mom who just wants to live out the beauty and richness of the liturgical year in her home with her children, and as this mom’s children have grown to start families of their own, it is also (I hope) a starting point for them. I make no claim to a professional sort of work and you may find a few errors. I did try to offer you something as polished and proofed as I could create because a tool should be sharp. This book is compiled by a lay Catholic who is faithful to the Magisterium and teaching body of the Catholic Church. This booklet is not affiliated with an approved ecclesiastical source. 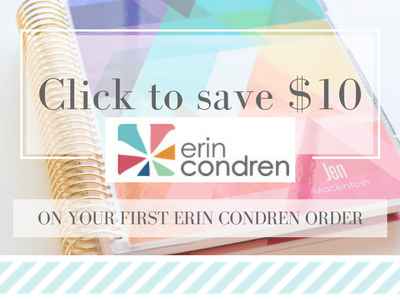 This planner is Catholic – from beginning to end. I want to be clear about that, and I hope if you are not Catholic, you will feel welcome, invited, and encouraged to use this planner and consider the riches here. After all, we may all claim the rich inheritance and liturgical traditions offered to us through the great Mystery of the Incarnation. The book contains the rich liturgical history of the season of Advent. It is a week by week planner which contains a daily listing of the liturgical feasts and customs appropriate to that day. Both the Extraordinary Form Calendar of 1962 (the Latin Mass) and the Ordinary Form Calendar of 1969 (the Novus Ordo Mass in the vernacular) are represented in the planner. Each day contains book ideas coordinating with the daily feast, and Advent customs. There is an index booklist for you to consider. You will find plenty of room to jot down new books you’ve found, existing books you have which may be different from those listed in the planner, or books you’d like to add to your daily reading. 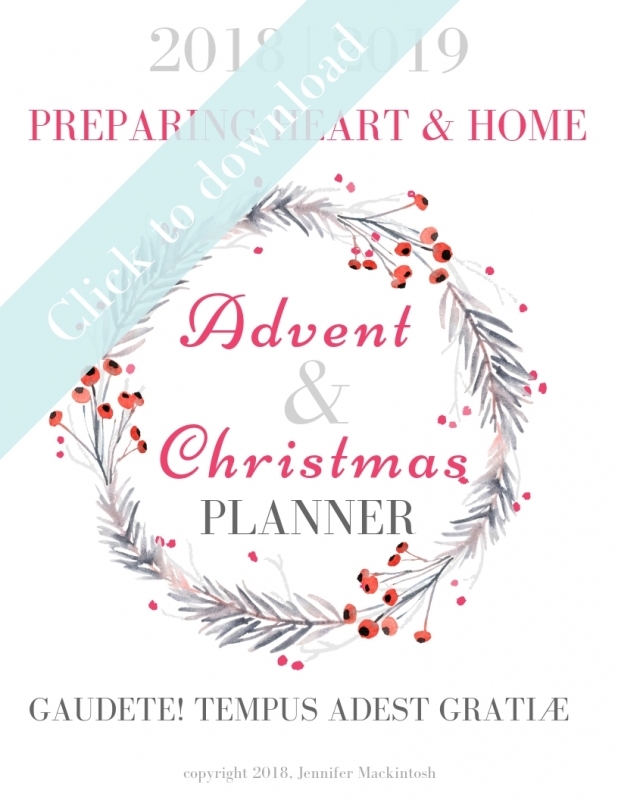 The booklet contains daily plans and ideas from November 30 through January 13 (the Feast of the Baptism of Our Lord) – covering Advent and the Christmas season. By all means share with your friends! Ad Majorem Dei Gloriam! Non Nobis! All I ask is that if you share, you share the link to this post, not the file. Also, sharing on social media is invited and encouraged. Please post the link back to this post. This book is copyrighted, Jennifer Mackintosh, 2018. Copyright permission is granted to print and use this within a family or small church or class group. If you would like to print and distribute large copies of this document, contact me first. 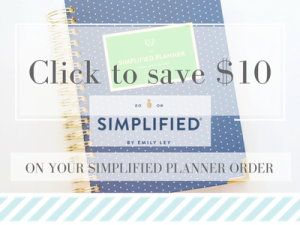 There are a couple of extras that are included in the planner that are ideas that have been shaped or formed through my own family through the years. I pray they are a starting point. All the books and resources in the planner (and more) are linked at the end of this post. Many of the links are affiliate links. They cost you nothing, but I may receive a small commission if you make a purchase, and I am truly grateful for that! This is a 35-page book this year. The book contains several printables for your use. I find it saves paper if you print pages 1 – 23 (two-sided), and pages 24 – 37 (one-sided) since the final pages are the printables. New to this year’s Advent planner is an iteration of the Jesse Tree which I came up with, almost by accident, last year. The variation brought together many of the practices (like the Jesse Tree and the O Antiphons) we love, but always had trouble keeping up with. For some reason, this practice was intuitive and workable from beginning to end. The Advent printable contains more along with all of the printables. O Antiphon symbols which I tuck under the dated stepping stones in addition to the Jesse Tree Symbols. You can create your own based on the O Antiphon prayer guide (linked above) or consider the beautiful O Antiphon ornaments at etsy. Printable number cards to designate the dated steps along the path – these are used to “hide” the Jesse Tree and O Antiphon symbol which is tucked underneath the number card. This year, I plan to print on cardstock and laminate. The printable number cards are attached to the end of the Advent & Christmas planner – for you to print and cut – one for each day of Advent. A small manger to place on day 25 – the Nativity. Small pieces of decorative straw (this can be found at Michael’s or Hobby Lobby) or straw colored yarn pieces. The little children add a piece of straw for each good deed completed in order to make the Baby Jesus’ manger soft for His arrival Christmas morning. 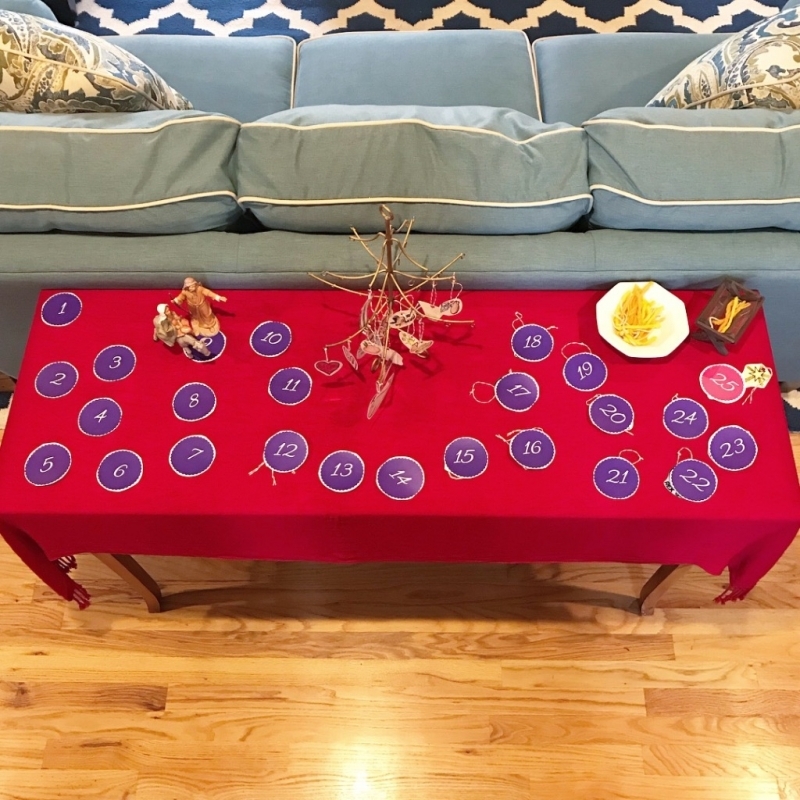 Family in Feast and Feria Advent posts – this blog written by my friend, Jennifer Miller, is a treasure trove of liturgical year resources. O Night Divine – a website built and maintained by another dear friend, Mary Ellen Barrett. This website is another delightful collection of Advent and Christmas resources. For years – and I mean YEARS (as in…since my Mom was homeschooling my brother and sister) – Dumb Ox Publications has been providing simple and beautiful tools to assist with living the liturgical year. They offer many Advent items that are very affordable! Theresa at My Catholic Kids is offering a set of Jesse Tree Stickers that she sent me to preview. 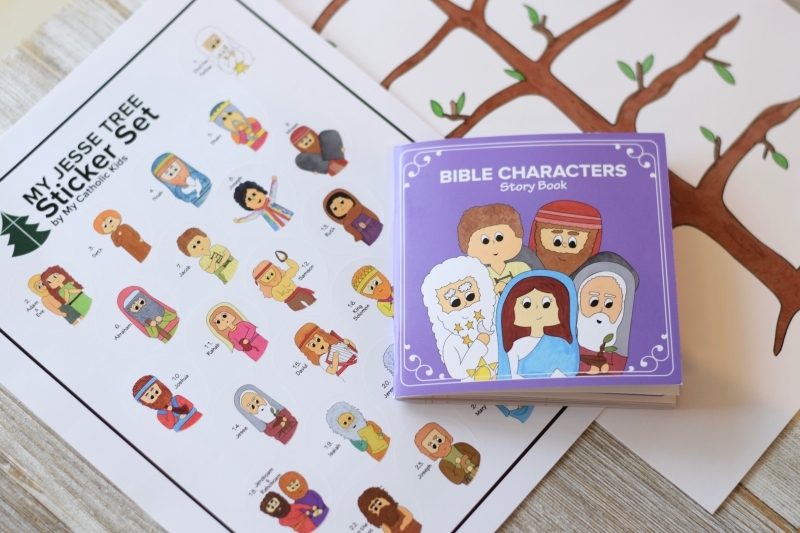 I think these would be fun for little hands during Advent! The Jesse Tree Stickers launch November 14, 2018! Shop them here – there will be lots of sales and launch day packages available just in time to order before Advent is rolling! I pray that in your home, the upcoming season of Advent is blessed with the quiet anticipation that allows room in your heart for the great joy and light of the Feast of the Nativity! Thank you for sharing and helping us to truly live the blessed season of Advent and Christmas in our domestic church…a true treasure! Blessings to you and your family! Lovely planner – Thank you for your blessing of celebration for our family! This is a wonderful resource! Thank you for making this and sharing it. God bless! May you be truly blessed in return for your generosity! Thank you for sharing such a wonderful resource and all the links and other information you have included are such a wonderful help. Thank you so much for sharing all of this! I’ve been Mom-ing for a long time :D, and I have plenty of years with kids still home. This is such an incredibly generous gift to all of us. From the bottom of my heart, thank you! Much love and God’s blessings to you! 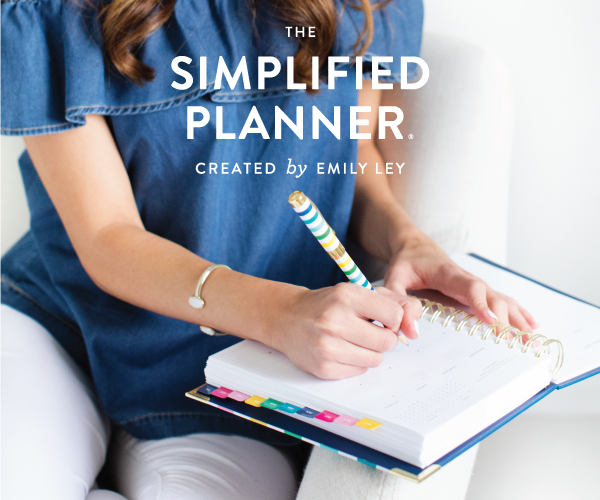 Thank you so much for sharing this lovely and incredibly detailed planner! I can tell it’s a labor of love. It truly is a labor of love! I pray it’s a blessing and a starting point! A very kind gift, Jennifer – may God bless you for it! God bless you and thank you so much for offering these wonderful resources to all of us as we are raising our little saints! Thank you so much for doing this! The number of resources you include is amazing!! And thank you for making it free. I was completely expecting to see a price to download. Wishing you a Blessed Advent and Merry Christmas!! How lovely this is. And how very sweet and generous you are to share this with us. I will think of you and your generous heart each time we use these resources. It is exactly what I have been searching for. Thank you. This is so beautiful and generous of you! I am especially pleased to see the Dumb Ox link as I thought they had gone out of business!